Getting your own basketball hoop is one step. Getting your own in-ground basketball hoop is a whole other step. This shows commitment and dedication to the game. Having the best in-ground basketball hoop will last for years on end, will give you more of an opportunity to train more, and most of all, will allow for hours of fun. Because of the nature of in-ground basketball hoops, this article has a very different layout, and a different buying guide style. Instead of spoon feeding you and providing a single best in ground basketball hoop, we’ll provide our choices by price range. We’ll price them at Budget, Mid-Range and Deluxe. Don’t worry, there’s something for everyone. We do apologise if prices change in the future. At time of writing this article, the price range of each hoop fell within their respective categories. Following our list of hoops, we’ll provide a small list of what we consider to be the most important factors to consider when looking for a hoop. Make sure you have a durable basketball to go with it! This is a comprehensive guide looking at every possible budget – and we hope we’ll answer the questions you may have. Use our table of contents below to skip to whatever stage you’re at with regards to an in ground hoop. The first hoops on our list that we evaluate and rate are all priced affordably. Typically, the hoops here are all purchase-able at a budget price whether it be in store, or on Amazon. There are some real bargains here. If you’re looking on the lower end of the price spectrum for an in-ground basketball hoop, then we simply cannot look past the Lifetime 71525. This is a serious hoop that is superior to all the alternatives in its price range (and a significant upgrade on the cheapest Lifetime 90020 model also available online). This particular hoop comes with a steel framed Makrolon polycarbonate 54-inch backboard which is designed to withstand high-intensity play. Makrolon is up to 30 times tougher than acrylic, and made to be extremely durable. A tough and huge backboard for a very affordable price. Is it dunkable though? Yes. The Slam-It Pro Rim is made with an arena-style wraparound brace, that supports a 5/8-inch solid hoop. When dunked, compression springs are present to ensure that the rim springs back into it’s original position. We note that as the backboard is made from Makrolon, you can be assured that it is shatterproof. In terms of further technical specs, the support pole provided is a powder coated round steel pole and comes in a 3-piece set up. The diameter of the pole is 3.5 inches – which is definitely suitable enough for the casual baller. A great feature, and a real stand out is the ability to adjust the height of the hoop. The 71525 is adjustable between heights of 7.5 feet to 10 feet. This also means that the hoop is great for younger kids – and can grow as your child does as well. The power lift is pole is lightweight enabling even the kids to adjust the hoop on their own without needing the assistance of the adults. However, because of the adjusting mechanism, it definitely isn’t as stable as other hoops in this list. The mechanism can feel a bit wobbly at times, and the pole’s overall sturdiness can feel compromised. If you’re not worried about adjusting the height, then we recommend always going for a fixed height hoop. Overall, the Lifetime 71525 Height adjustable Basketball Hoop is a great in-ground hoop and a perfect hoop for beginners. Either way, for us, this is the best in-ground basketball hoop in the budget category, offering value for money. 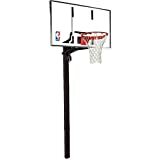 The second in our cheap options, and still one of the best in ground basketball hoop in the cheap price bracket, the Lifetime 71281 offers everything you could possibly want in a super affordable hoop. You’ll notice straight away that the 71281 usually comes in at a slightly cheaper price point. Whilst it would seem like it’s nearly the exact same hoop as the 71525, there are some seriously stark differences when you really delve into the details. The similarities between this, and Lifetime’s alternative, is that they both share the same pole and height adjustment mechanism. That is, a 3 piece 3.5″ round support pole (that is powder coated and UV protected), and a Power Lift adjustment system that allows the hoop to adjust from 7.5 feet to 10 feet. Again, this allows the hoop to grow with the height you need it to be. Where are the differences though? The backboard comes in slightly smaller at 52″. We note that it is made with the same Makrolon material to ensure durability throughout the seasons, and throughout any tough play. Further, whilst dunking is still very possible with Lifetime’s inclusion of the Slam-It rim, it isn’t as durable as the alternative Slam-It Pro rim that is also available on alternative hoops. Whilst these two factors aren’t really a make or break, we feel that because we had to highlight them, the slightly different price point of Lifetime’s two hoops was negligible. Either way, this is a great hoop, and definitely one you should consider. You won’t go wrong here. Looking away from Lifetime, when looking for the best cheap in-ground basketball hoop, Spalding also offer up an excellent option. Their budget model that suits this criteria is the Spalding 88454G. This hoop from Spalding comes with an extremely sturdy backboard that is made using 1/4″ thick tempered glass. Tempered glass, as you’d expect, gives you the most authentic feel, true to play. A superior product to any forms of plastic. The backboard is supported by a steel frame, similar to that of Lifetime’s products – so you can be assured of durability throughout the seasons. Although at a cheaper price point, the hoop is extremely stable as well. Spalding have included yoke arms in the design to significantly improve stability and levelling. Yet again, stability isn’t at it’s full potential. The adjustment system (that allows the hoop to adjust from 7.5′ to 10′) can sometimes compromise the overall stability of the hoop. However, this shouldn’t be too large of an issue. A completely different factor is that the support pole is a 2 piece pole; in fact, it’s a 4″ square pole as opposed to a round pole typically offered. This doesn’t pose too much of a difference in general performance. Finally, this hoop is definitely dunkable. It comes with Spalding’s Pro-Image Rim that breaks away as a good breakaway rim does. Although the hoop isn’t made to withstand consistent dunking – it is still a very durable hoop. Why isn’t it our top pick? The backboard does tend to shatter. If you’re a serious player who loves their hoop, then chances are you’ll have to call up Spalding to utilise their warranty to replace the backboard. The warranty is super easy to deal with, but you’ll still have to run through the hassle of replacing the backboard. Simply said, this is an absolutely ideal hoop that manages to find the perfect balance between price and performance. A premier play system, this is made with an extremely sturdy 5mm tempered glass backboard which gives an authentic rebound. This is supported by a 3/16′ steel frame. Durability of the backboard is absolutely assured by Silverback here. Player safety is also given a significant priority as well. Although not provided in the smaller SB54 model (54″ backboard), the SB60 comes with backboard and pole padding. This is a cushioning pad made with high-density foam and is completely covered with nylon shell – going right around the edges of the backboard, and around the pole. This is aimed to provide protection especially during contested rebounds and lay-ups. A nice touch by Silverback. Like most hoops on this list, this hoop is dunkable on. The rim provided will break away. The adjustable hoop is also held up by a 4″ square pole that has been DuPont powder coated from the ground up. This is in addition to the DuPoint Corrosion Armor also used on the hoop. Rust will not be an issue, nor will the hoop corrode. If any element of rust arises, Silverback will usually back it wiht their 5 year limited manufacturer warranty. Finally, what separates Silverback from the cheaper alternatives is the mounting anchor point. This style allows for the owner to unbolt and move the hoop where it is absolutely necessary. This means that you don’t need to completely rip up the concrete to move the hoop. Tough and stable, it’s almost impossible to look past this hoop. In terms of overall guaranteed durability, the Goalrilla GS54 is an excellent option. You’re paying for assurance here – especially with the lifetime limited warranty on offer. It’s definitely one of the toughest hoops in the market when looking to hoops priced in the mid-range. The reinforced backboard is made using tough tempered glass to give an authentic look and rebound. At this price point, it’s the minimum you should expect. You can be guaranteed of maximum performance with a backboard of this quality. A crank actuator is used to adjust the hoop. Although not difficult to adjust, this highly complex system minimises vibrations to a large proportion. However, consumers have reported that vibrations are present after each shot. The pole is also constructed using high-quality powder-coated steel to provide ultimate resistance against rust and with the help of UV protection, the color also won’t fade away easily. Another huge benefit of the Goalrilla GS54 is that it also uses a removable anchor system. Like the Silverback, if you’re about to move houses, or need to move the hoop for any reason, you can simply unbolt the hoop. Factors that we must highlight is the difficulties during installation. The backboard is a bit heavy and requires a couple of people to hold it during installation. Similarly, many people complain about the manual; stating that is not adequate with enough instruction to do the installation yourself. If you don’t want professionals installing the hoop, this could prove troublesome. All in all, this is a premium hoop just shy of being at a premium price. Whilst it’s not the best pick in our opinion, its performance won’t let you down. These are the cream of the crop. If you’re serious about spending money on a hoop, then these are options that are made to last a lifetime. Any option here is well worth the money – and for the serious baller. If you are looking for the best in-ground basketball hoop and aren’t afraid to spend some money, then the Lifetime Mammoth stands at the top of the pile. Whilst the Mammoth range comes in 54″, 60″ and 72″ backboard sizes, we have opted for the 72″ model here. This is a regulation size hoop not for the feint hearted. First thing’s first. The brand – Lifetime – as we’ve said before, is arguably the most known basketball hoop brand for quality. This premium hoop is no different. The 72″ backboard is made to withstand all the dunking in the world. A spring-back rim is also provided to support the hoop as you dunk. Lifetime have further implemented steel extension arms to provide the added support needed for such a heavy backboard. You can be assured of stability and safety here. Why is it so expensive though? Well first, it’s regulation size and it’s made to last forever. It’s also backed by Lifetime’s lifetime warranty… the only bummer is this warranty won’t cover damage to the backboard. The Mammoth Pump height adjustment mechanism uses a shock assisted handle. This allows for anyone (even a child) to set their own height anywhere between 7.5 feet and 10 feet at infinite increments. You can set the exact height you want. The 1 piece pole is also a huge 6″ x 6″ made to withstand the harshest weather conditions. As soon as you see, feel and bolt it down, you know it won’t move. For us, such a premium price warrants this product. One of the most sold basketball products at this price range – you need to see it to believe it. You’ve finally made it to the end of the list, and by that, our last pick for hoops at a deluxe price. Being completely honest, Ryval probably isn’t a brand most people think of when they think of basketball. This hoop, however, creates a reason for that sentiment to one day change. The Ryval C660, although not their top of the range, is a definite recommendation from us simply due to the price vs durability vs performance factors. If you’re looking for a regulation hoop, and didn’t like the Lifetime option, then Ryval also has their C872 regulation model. The features of the C660 are simply astounding. 60″ tempered glass backboard with a gym-like rebound and quality will impress even the most stubborn baller. This is supported by an aluminium trim that goes right around the backboard for increased durability and stability. Rust is no issue as well – although that’s expected at this price point. A 1-piece premium powder coated 7 gauge pole is tough and extremely stable for even the heaviest of dunks. Similar to the Lifetime, there are no set notches for adjusting the hoop height. You’re absolute to infinitely set the hoop to any height from the industry low 5 feet, right up to the regulation 10 feet height. The hoop will grow with you. Finally, alongside the free gusset, pole and backboard pads provided with the hoop, Ryval offer lifetime warranty on their products. Not just any warranty though – Ryval offer a dunk-proof warranty. Ryval pride themselves on the hoop being durable enough to withstand dunk after dunk – and they back it with this warranty. Another premium product made to last a lifetime – Ryval will not let you down. The only issue is the 72″ model, in our opinion, just isn’t as good value for money when compared to the Lifetime option. Nevertheless, if price isn’t an issue, then this might be ideal for you. In ground hoops aren’t cheap. It’s often said that quality costs money, and in this case, it couldn’t be more true. However, there’s always something for everyone’s budget – provided to plan and meet the requirements you set out for yourself. There’s a common internal debate that people have – should I buy a portable hoop, or an in-ground one? Of course, we can’t provide an answer for you. We believe that if you’re after a longer lasting hoop, then an in-ground hoop is a far better option. Although portability may be ideal for some people – being frank, how often does a basketball hoop truely get moved. Most of the time, once the base is filled, the hoop won’t move for years. A far better option is opting for an in-ground hoop in this circumstance. For us, making sure that an in-ground hoop is suitable for you is arguably the most important factor to consider. Following on from this, you absolutely need to consider the most suitable size of the backboard for your court. 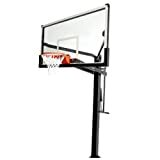 Backboards come in various sizes ranging from 48 to 72 inches. Although it’s awesome having a regulation 72″ backboard in your own back/front yard, you will have to stump up a lot of money for one. Get a backboard size that suits the court you have avaliable. We typically recommend that you need at least a 2 or 3 car drive way, or at least a half court to justify buying a 72″ backboard. Similarly, anything smaller than 54″ may feel a bit inadequate for a court of this size. Adapt and buy accordingly. Typically a factor that goes under the radar – but makes an absolutely huge overall difference. The most true and authentic gym feel is to buy a tempered glass backboard. This is found in almost all the hoops in the upper end of price range. Buy the best you can afford. If you want to simply invest in a more budget basketball hoops for beginners, then it’s also possible to buy a backboard made using polycarbonate material. As expected, because polycarbonate is light in weight, don’t expect the rebound to be fantastic. The pole is the backbone of any basketball system. A good pole should ensures overall durability and stability. There are a number of pole options on the market. You’ll see one piece, two piece, and three piece; which is also divided into either a round or square pole. As common sense would assume, the less pieces, the stronger the stability of the overall system. This is why you’ll see one piece poles dominate the expensive side of the market. Similarly, square poles are typically a lot tougher than round poles. This is not to say that round poles are bad, they are just usually cheaper to make, and don’t offer the same dimensions that a square pole can offer. Most (if not all) in-ground basketball hoops now come with breakaway rims that minimize the shot and dunking impact. If you’re unsure what a breakaway rim is – simply put, it’s a rim that will bend slightly when a player dunks on it. It will snap back into original position as soon as the player’s weight is removed. Although it’s a factor to watch out for, it’s definitely low on our list. Having a high quality rim is an absolute necessity – yes we will agree with that. However, quite literally every in ground hoop on this list comes with a high quality breakaway rim. Whilst the quality does seem to improve as you go up the price ranges, you definitely shouldn’t expect a poor performing rim in any circumstance here. It’s hard to compare and pick and choose from such a wide range of products at such drastically different price points. Do we have a favourite though? When balancing durability, cost and performance, it seems like the Silverback SB60 is just so hard to beat. We definitely can’t say it’s the best in-ground basketball hoop on this list – the hoops in the Deluxe bracket are in a league of their own… but not everyone has the funds to spend an upwards of $2000 on a hoop. We are simply making a judgment based on everything we have seen. Disagree? Let us know. Have had a bad experience with any of the hoops provided? We want to hear it. What we will conclude on, however, is for any serious basketballer, buying your own in-ground hoop is an absolute must have. It will change the way you practice.